The following story was copied from the USS Helena Newsletter dated June 2002. 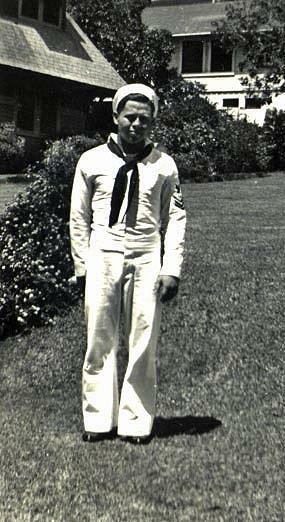 "The Last Sailor Off the U.S.S. Helena"
I believe I was the last sailor to leave the Helena. The reason for my thinking is that two damage-control sailors and I were fighting to put out a fire in the hanger. We were able to get the fire out, but never heard the order to abandon ship. After the fire was out, we went forward and began to argue about where we were to abandon the ship. The custom was to always abandon at the fan tail. The ship was already bending together, and we were walking downhill to our general quarter station at mid-ship. There we separated. The other two sailors left to go to the stern of the ship. I never saw either of them again. I believe one sailor's name was Schneider. When I got topside, water was beginning to cross at the breaking point. I walked off, got about 25 feet when the ship broke. It came together and sank. I was pulled back after the ship went down. I heard the noise of the air compartments escaping and the boilers bursting. The air and water lifted me up into the air. I thought my time had come, but again I was lifted up and not submerged. I then settled down and began to swim away from the area. After the ship was gone, I was alone for an hour or more. I remember taking my flashlight and seeing if it still worked. I turnd it on and the flash was so bright it scared me. I dropped it in the water. I took off my shop keys and tried to hit the flashlight as it sank, but I missed. As the swell of the ocean took me up and down, off in the distance I could see a group of life rafts. Not knowing if they were our sailors or the enemy, I kept very still. After I kept watch for awhile I spotted two of the sailors coming toward me. As they came nearer I could hear them whispering to each other. I recognized one of the voices. I called out, "Is that you, Red?" He called back, "Is that you, Wedgehead?" It was Red Thomas, a shipfitter from Texas. To see a recent picture of Fred, click Here. To view pictures of Fred's 8 brothers. All served in the military during WWII, click HERE.